At the New York Comic Con screening for ABC's Once Upon a Time, we were shown an intriguing fantasy comprised of equal parts promise and problems. But the panel with creators Adam Horowitz and Eddie Kitsis, late of Lost, convinced us that the show will be worth sticking with, post-shaky pilot. These guys are masters of the flashback, and they hinted at the intriguing trips to fairy tale land in that are in store for Once, along with the familiar faces who will be stopping by to play your favorite heroine or nightmare of old. Spoilers for the pilot ahead. 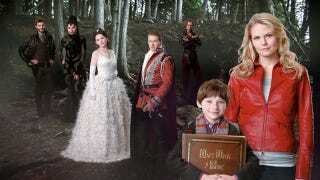 Once Upon A Time is fun, quick-paced, uneven, and utterly, wonderfully bizarre. You have to be willing to accept from the get-go that some of our favorite storybook characters have come alive, transported by a curse to modern-day Storybrooke, Maine (yup), "a truly horrible place" in the words of Snow White's Evil Queen, who sends them there. The pilot veers between highs and lows: it can be rollicking and clever, or else veering too Disney or over-the-top. Once is family-friendly to a point — there's violence enough, both physical and psychological, which rightly fits to fairy tales, though in the pilot it's mostly low-rent Ringwraith terrors. Many beloved characters and actors are to be found in both Maine and the Enchanted Forest: there's the aforementioned Snow White, whose tale seems central (a lovely Ginnifer Goodwin, totally transported from Big Love), her hunk of a Prince Charming (Thor's Josh Dallas, who is rather radiant), Lana Parrilla as the Evil Queen, owning every scene she's in (you'll find yourself waiting for her), and 28 Weeks Later and Transpotting's Robert Carlyle as a standout slithery Rumpelstiltskin. We'll also be hearing from Jiminy Cricket (Raphael Sbarge, when not a cricket), Gepetto (Tony Amendola) and his Pinocchio, Red Riding Hood and her Granny, select Dwarves (including PoTC's Lee Arenberg as Grumpy), The Magic Mirror (Giancarlo Esposito), Cinderella (Falling Skies' Jessy Schram), and many more, if Once runs for the full 13 episode-season it has been allotted. Special guest appearances by fan favorites like True Blood's Kristin Bauer as Maleficent and Buffy's Emma Caulfield as Hansel & Gretel's Blind Witch, as well as episodes penned by genre favorite Jane Espenson (Buffy, Caprica, Torchwood, Game of Thrones) provide further incentive to tune in in coming weeks, even if the pilot doesn't initially bowl you over. Jennifer Morrison (House) plays Emma Swan, a tough-as-nails knockout bailbonds "person" with the ability to always tell when people are lying and the potential to develop into a more multi-faceted character. Emma is confronted by the son she gave up ten years ago, the preternaturally brilliant and troubled Henry (Jared Gilmore, preternaturally brilliant), who begs that she return with him to save his hometown of Storybrooke, where his hateful adoptive mother reigns over a cowed populace...as mayor. Henry is convinced that Emma is the prophesied daughter of Snow White and Prince Charming that he read about in his book of magical stories, sent by her parents to another world in order to save the good people of fairy tales from the curse that has cast them into a sleepy town in Maine that time forgot. Running parallel to their roles in the Enchanted Forest, the modern-day Snow White is a kindly teacher named Mary Margaret, her Prince Charming is a John Doe in a coma, and the Evil Queen is both the mayor and Henry's icy-hearted guardian, Regina. Here Rumpelstiltskin is pawnshop proprietor Mr. Gold, who "owns the town," at least where money is concerned, a vamped-up Red Riding Hood is portrayed as trying to "sleep her way around the Eastern Seaboard," and Jiminy Cricket, a.k.a. Archie Hopper, is a bookish child psychologist. Throughout Emma's initial reluctant interactions with Henry and Storybrooke's population, we see via flashback how the curse came upon the realm of the Enchanted Forest. The primary problem of the pilot — save for having to swallow some clunky dialogue like "[the Forrest] animals are abuzz with the Queen's plans" — is where to go onwards, since fairy tale land has been laid to ruin in the first episode and its occupants expelled to Maine. But hints from the creators on what's in store laid out a far more twistily interesting path for what we'll see in the realm of fantasy than the pilot suggests. Once Upon a Time creators and writers Adam Horowitz and Eddie Kitsis told the audience at the NYCC panel that there's a lot more to come in both worlds, with the storylines veering from modern-day to magical mythos and back on a weekly basis. Coming from their Lost background, there may also be hidden plot-points in numbers and other encoded messages, sure to please the conspiracy aficionados. What interested me most was their revelation that future episodes will explore both the primary and background characters' motivations in the Enchanted Forest — "what made them who they are" by the time we meet them as recognizable archetypes. So while in the pilot characters are often writ in uncompromising shades of black-and-white — selfless shiny good versus vindictively cruel evil, which can be heavy-handed at times — that may lessen as we learn what really shaped their lives. Why did Jiminy become a cricket? How did imp-like Rumpelstiltskin become a prophecy-spouting ambiguous villain? What so damaged the Evil Queen that she would try to fatally poison her step-daughter for being prettier than her? In contrast, the same characters in Storybrooke will be facing "the voids in their modern lives," the needful things they have lost by being transported from a place of everlasting love, faerie, dragons and towering castles. It does not appear that the show is interested in retelling the fairy tales in terms of their often harsh origin stories out of non-Disney folklore (in the original Cinderella, for example, her stepsisters cut off their toes and heels to fit the magic slipper; in the original Sleeping Beauty, the prince does a lot more than kiss the princess upon discovery and she only awakens when she gives birth to twins). Rather it seems that the creators and writers have established their own mythology with nods to the timeless yarns we were read at night, but are keen to add a modern twist of pop psychology and deeper character exploration. This idea was further emphasized: Horowitz and Kitsis said that if Lost was ultimately about redemption, Once is about hope, a word we hear bandied about a lot in the pilot. When asked why we're seeing such a glut of fairy-tales-in-the-modern day coming to the screen — NBC's Grimm is also on the fall schedule and an adaptation of the comic series Fables is potentially in the works — the current uncertainties of the global economic climate were cited as a driving force. They pointed out that Disney released its wildly popular animated Snow White at the height of the Great Depression; fairy tales have ever been about escapism from unkind reality as much as moralistic lessons. "There's something comforting about the stories," we were told. And at a time when many could use their own dose of comfort and "happily ever after," Once seeks to provide storylines that particularly click with today's audience, i.e. noting that Cinderella's tale is the ultimate kiss-off and triumph over a vicious and exacting boss. I don't want to curse Horowitz and Kitsis, who have worked together on many other projects (Tron: Legacy, Birds of Prey, Popular and Felicity are amongst their credits) with some of the pitfalls that would befall later seasons of Lost; I'm all for giving them the benefit of the doubt. But it remains to be seen whether they can sustain the enchanted flashback momentum while further developing Storybrooke's citizens. It's also worth entertaining the notion that the fantastical sights we see are merely the production of young Henry's imaginative brain; he's a miserable kid, in therapy at ten, in search of his birth mother; why not cast her as the destined saviour out of his favorite book? Once could inspire Taming of The Shrew-like debates as to whether the supernatural elements afoot are actually "real" or are the fabrications of an overwrought mind. It's clear that a lot of time, plotting, energy and money has gone into the show. The visuals are striking for a weekly series, and where they are cheesy and overdone it still works for both comedic and dramatic effect. The creators insist that their take-away from Lost was that "character has to trump technology," and they've certainly drawn some colorful ones. The pilot probably won't dazzle you, but the talented cast and roster of upcoming guest stars and scribes is a good reason to give the show support in order to see if they can pull off the twistier upcoming developments we heard about at NYCC. If you ever wondered why a man turns cricket, how an Evil Queen earned her name, or if there's more to Snow White than meets the dewy eye, Once Upon a Time would like to tell you a story.